Alcatraz is a stealth-action game that was also released on MS-DOS and the Atari ST.
You play the role of an American soldier who must enter the high risk Alcatraz prison and capture Miguel Tardiez, public enemy no.1. Scrolling from left to right, you start off with only a knife. Once you kill an enemy they'll drop more powerful weapons including guns, flamethrowers and grenades. Switching between them is odd though as you can only do so by holding Up to go into cover; only certain parts of the level allow you to hide and it's not always obvious. After you've entered the Barracks Building the game suddenly switches to first person mode where you need to use your map to shoot guards and locate a document. You'll eventually have to scale the walls and enter the cellhouse via the roof before abseiling back down and rushing to reach your helicopter. 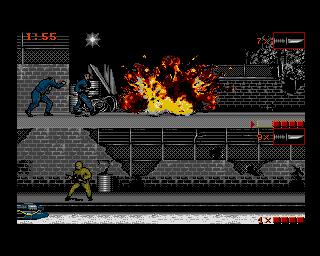 The game is very difficult due to the limited visibility of the cropped screen, the fact that you only have three lives and that the time limit for a successful mission is just two in-game hours. It's still a lot of fun in co-op mode though and once you're familiar with the levels it becomes more bearable and you'll learn to share weapons equally amongst each player. The main problem comes in single player mode as the screen is still split in two, with the bottom half reserved for what appears to be a non-functional player. However, you're actually expected to control both players and switch between them by pressing the Return key! The game is hard enough with just one person, let alone trying to multitask and I have no idea why the developers didn't add in a CPU partner. Alcatraz is a great co-op game that mixes action, stealth and strategy and bundles it with a handful of interesting gameplay styles. It's just a shame that the single player mode is such a let-down as the lack of a CPU partner ruins the experience completely. Random trivia: If you're finding the game a bit too tough type in the word 'cokebusters' during the mission briefing screen. You'll see a quick flash which means that you now have unlimited lives!